To report on the strangest beast I’ve ever seen. Defied gravity without aid of legs or steam. Is it animal, vegetable, mineral or metal? This is the question they want me to settle. With a noise to strike fear into the fainthearted. In the most bizarre garb, a real dandy jack. I bring divine wisdom for the good of all men”. That madman on his dandy mechanical horse. Until their shoulders and throats were aching and raw. There’s more to this man than at first meets the eye. This man is only in search of the truth. One of William Martin's more notorious inventions was a travelling machine, the ‘Northumberland Eagle Mail', in 1828. 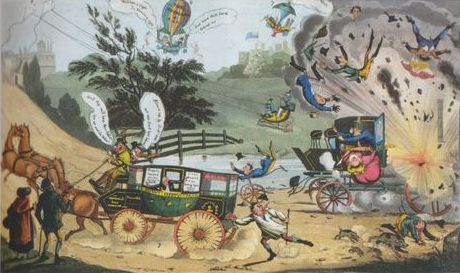 Locally nicknamed the ‘Dandy Horse', it was exhibited at the White Hart Inn in Newcastle's Cloth Market and when William gave a demonstration of it on the Town Moor, in the words of a reporter at the time, "he got excessively hot propelling it over the rough ground and was pelted with mud by the spectators". 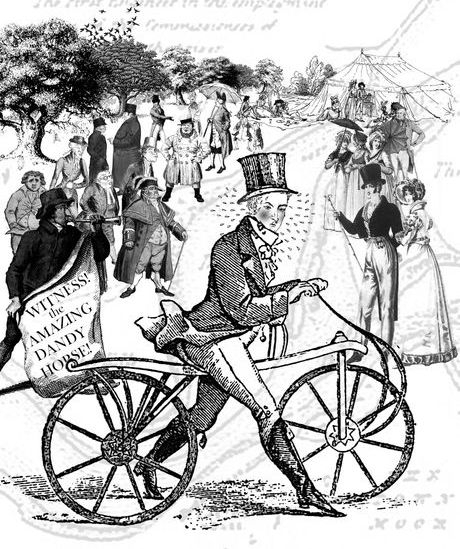 "This machine", William claimed, "is calculated to carry any Man in Health to any Part of the Kingdom, being a superior Mode of Travelling to either Riding or Walking. It has a noble and majestic Appearance; and the management of it requires but such gentle Exercise that it will materially benefit Health. It is the only Travelling Machine that ever was invented in the World to work from the Centre of Gravity, without the Aid of Horse or Steam." New Principles: or the March of Invention, Thomas McLean, c1824-1830. Science Museum Group.